I promised this post awhile back. Then the rest of spring and summer happened, which means busy times on the homestead. I've picked it up again because I'm working on my next book, Critter Tales. 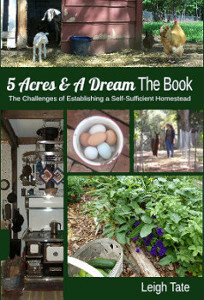 Like 5 Acres & A Dream The Book, I not only want to tell an interesting story, but I want to weave in useful information as well. Surprise's near death experience and what I learned from it is something I want to include. Here it is as a blog post, preliminary to being included in the book. Last spring I had a frightening experience with Surprise, one of my pregnant Nubian does. It started with her being picky with her feed and losing interest. She soon became weak and disoriented. She went down and I could not get her up. With the help of the internet I figured out some things and managed to save both her and her twins. At the time I had to sift through a lot of information, which I had difficulty sorting out in my emergency state of mind. It's taken some study to clarify and understand what happened. This post is my attempt to write out and restate what I've learned. Pregnancy toxemia (also called ketosis or twin lamb disease) and hypocalcemia (milk fever), are life threatening conditions which must be addressed immediately or the doe (or ewe) will die. Neither are diseases, but rather metabolic conditions which are primarily feed related. The cause and treatment are different. The response to treatment determines diagnosis, but since hypocalcemia can lead to ketosis, treating for both is a good idea anyway. If you're like me, then you have negative feelings about utilizing Propylene Glycol. It's the "anitfreeze" used in most commercial ice creams. Ordinarily I would avoid it, but in an emergency it's better than losing the doe and her kids. It's used because it is easily assimilated by the body, immediately providing much needed energy. It is also the primary ingredient of Nutridrench, which also contains molasses, calcium, vitamins A, D, and E plus selenium. Initially this is what I thought was Surprise's problem. But I also noted that Molly at Fias Co Farm said that she found treating as for milk fever helped. Because of that, I also gave Calcium Gluconate injections. In an attempt to find anything for her to eat, I offered dried comfrey leaves. Comfrey is rich in calcium and because it was the only thing she was interested in (devoured it, in fact) this is the clue that helped me later figure out Surprise's actual problem. Hypocalcemia occurs when the doe's diet contains an improper calcium/phosphorous ratio. Grain is usually the culprit here, because it is high in phosphorous but low in calcium. The pregnant doe needs at least twice the calcium in her diet, i.e. 2 parts calcium to 1 part phosphorous, especially during the end of her pregnancy, when the kids are needing calcium for bone development, or immediately after kidding when her body begins to produce milk. If she can't supply calcium through her diet, her body will begin to deplete her own resources. Besides bones and teeth, calcium is also necessary for proper muscle function (skeletal, heart, digestive, uterine). With a calcium shortage, muscles become weak so that the doe becomes weak: she can no longer stand, digestion slows, uterine contractions will be weak, and eventually her heart will give out if the problem isn't corrected immediately. 40 - 50 cc Calcium Gluconate injections subcutaneously. Because of the volume this must be divided into 4, 10 cc doses and injected slowly in 4 different spots. Continue treatment several times a day for several more days. She'll fight like crazy but she needs it. Watch her closely after that and give more if needed. Also, treat for ketosis. Since she's stopped eating, this will be a secondary problem anyway, so treat for it. Sue Reith recommends a CMPK (calcium, magnesium, phosphorous, potassium) supplement, either injectable or oral. She gives a homemade recipe here. Prevention: It's all about diet. Some commercial feeds and mineral supplements already have the correct calcium:phosphorous ratio. If a doe is getting grain instead of commercial feed, however, she needs twice that in a source of calcium. Usually alfalfa is used, but this is where we got into problems. I learned that my alfalfa source had started using GMO'd alfalfa. I freaked out and stopped buying it. This was my near fatal mistake, because I did not have a sufficient calcium replacement. Pat Colby (Natural Goat Care) gives dolomite instead of alfalfa. Also comfrey is rich in calcium, although I confess our hot, dry spells cause my comfrey to do poorly. Another possibility is Chaffhaye, for those for whom it is locally available (or can afford to it shipped). Alternatively, don't feed grain. This is more difficult with the high yield dairy breeds like Nubians, but hardier breeds like Kinders can do well and maintain good weight on a forage and hay diet. I am fortunate that things worked out well. Losing animals is always difficult, making victories all the sweeter. Needless to say, Calcium Gluconate and Nutridrench are now standard items in my birthing kit. What is interesting is that my other does were the same diet but not have the same problem. I don't have an answer for that, other than goats are individuals, and respond differently to different things. Not that I would risk a repeat, but I'm thankful they did better than Surprise. Dairy Goat Care & Management: Ketosis - What Is It? Hypocalcemia & Pregnancy Toxemia in Goats © Sept.
Do they put calcium in the loose minerals? I would like to breed my does next year and am beginning to realize how much I need to study before I do! Barb, all of the loose minerals I've researched do have both calcium and phosphorous in the correct ratio. So, you'd have to take into account whatever else you're feeding them, because the 2:1 needs to be for the entire diet. Of goat minerals, many contain copper, which can be toxic to sheep. I can't recall if you're housing your sheep and goats together, but if you are, you'd need a mineral mix that can be given to both. Sweetlix has one and I'm sure others do too. If your soil and hay are not copper deficient, then that's all you would need. If you do have a copper deficiency, then you'd have to consider something like a Copasure copper bolus for the goats. I often hope no one calls the SPCA on me as I try to figure out how to be a better steward of our animals. We lose some due to incompetence on my part but it's a growing experience for both me and my kids. The harder loses are situations due to neglect or lack of foresight. It took us a year to correct a gouged teat to our cow as she ripped her udder on a tree branch while pregnant. We should have cleared the cow pasture better. And then she got milk fever on top of that (often happens in dairy cows. Vet had to give calcium shots to overcome the effect.) We've tried to use diet to minimize milk fever but haven't quite mastered that yet. Very good information and explanation, Leigh. I hope your does do great this year. It's hard when our animals don't do well, but especially when it's from something we either didn't know, or haven't figured out yet. Good luck on your new book! Good luck with the new project, looking fwd to reading it! Continued good luck with your stewardship of the animals. Not only thrilled for your victories for the animal's sakes, but greatful to have the benefit of your knowledge & experiences. Internet neighbors rock :). 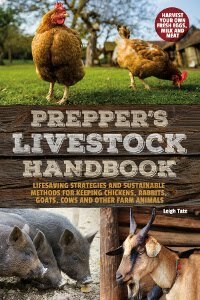 I am not sure I want to have goats on my future acreage, but this is good information regardless. It really shows the importance of maintaining a proper diet for any animals on your land. Thank you for this post. I had better start looking into the proper diet for my future chickens and rabbits. Doug, I can so empathize. More's the pity that animals can't tell us how they feel. I do know that cows get milk fever too, but not having any experience in this area, did not address it. Fern, thanks! Seems like every time I think I have every thing figured out, something new happens! JW, that's one of the best benefits of the interent. I've used it every time I had a crises! Matt, I agree. So wise of you to start your research now. You'll likely still run into situations, but at least you'll have a basic knowledge base for a good start. I feel protective of females, of all species. When our cats are pregnant or nursing , they get special rations to help. Thankfully we haven't been through that with our goats, ferrets, dogs, or horses during the course of living up here. My wife had a bad time with both our children, and I think our obsession with taking extremely good care of our animals during pregnancy may be related to that. We used to have these problems with our ewes when they were pregnant. Propolene glycol is a lifesaver and we always kept lots around. Nutri drench, too. Pretty soon all feed will be GMO. Harry, a bad experience always seems to serve as a motivator for us too. I just hate that I've had to learn so many things the hard way. Tewshooz, those are things I'll always have on hand now. I'm just relieved my life lesson here turned out so well. If something doesn't stop them, then we will likely end up with everything GMOs. So many nations are banning or restricting that now that there is an economic hope that something will change soon. They certainly won't admit they're wrong about the stuff and stop making it on their own! I tried to make a return blog visit, but your profile is set to private.